For the longest time, I did not have any data on my phone. While this meant rejuvenating, undisturbed naps on the bus and $15/month phone bills, there were also some drawbacks. I sometimes had to rely on the power of luck and random guessing to locate things, and meeting up with friends I had forgotten to get the numbers of sometimes turned into a nightmare. However, what really brought things to light was this one time I went to a restaurant with no Wi-Fi to enjoy some XLBs with my family when all of a sudden, I opened Snapchat to see an hourglass next to a three-digit streak. My world was about to fall apart. I immediately dropped the XLB I was holding, ran out to the street, and then stood outside each restaurant to see if it had free Wi-Fi I could borrow for just one minute. Pedestrians were watching me with concerned looks on their faces. Fortunately, I managed to save said streak, and after a few awkward moments with my parents, I finished my dinner in peace. 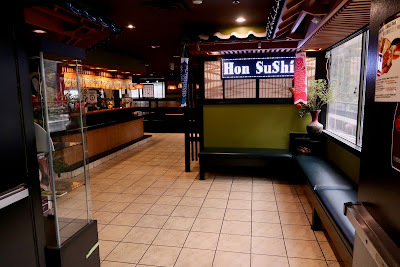 To prevent this from ever happening again, I went to Metrotown, got a data plan, and proceeded to nearby Hon Sushi to celebrate my victory against the no-data life. Hon Sushi is a large Korean-Japanese fusion restaurant located on Kingsway near Old Orchard Shopping Centre. The dining room was not the only thing that was large. The menu was so big that it took me a good 10 minutes just to read through it. There were 3 pages of Korean dishes, and they even served the large Korean hot plates with toppings along the circumference of the plate (the kind found at Ta Bom). My lunch started off with a very delicious serving of Takoyaki (octopus balls). The balls were not very large, but they were soft and pillowy with an excellent crispy exterior. Inside each ball was a flavourful piece of octopus with just the right amount of chew. On top were well-balanced drizzles of sweet takoyaki sauce and mayonnaise. The rice in the Chopped Scallop Nigiri was a bit too tightly packed and under-flavoured (as with the rest of the nigiri), but the sweet scallop on top tasted fresh. 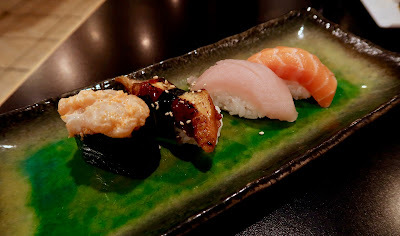 The unagi had a smoky flavour and was amply dressed, while the tuna exhibited a decent soft texture. The salmon was pleasantly buttery and fresh. The Aburi Tuna Nigiri lacked flavour and was a little over-seared. The rice here needed more flavour as well. However, the Aburi Salmon Nigiri had a delicious, smoky flavour, and the juiciness of the salmon was preserved through the searing. 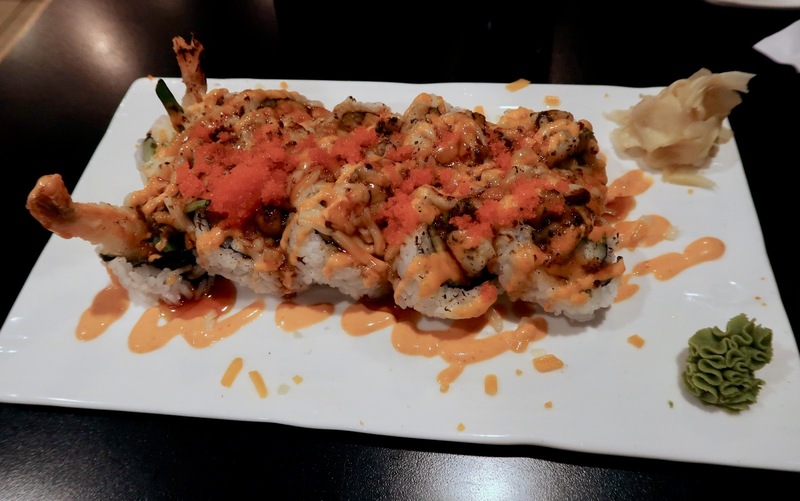 Hoping to end my meal with a heavenly roll, I chose the Angel Roll, which came with tempura prawn, imitation crab, scallop, cucumber, avocado, and cheese. The concept was promising, but the execution was flawed. The scallops were over-seared (and thus hard), while the crab meat ended up being mushy. The mushy crab meat was paired with mushy rice. The cheese was not melted into the roll properly, and the scallops kept falling off the roll. It was as if an angel constructed the roll after consuming 24 shots of vodka. 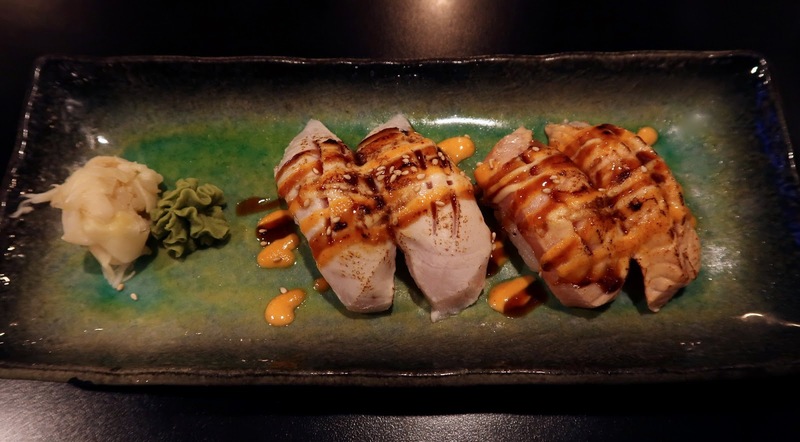 The only thing this roll had going for it was the prawn tempura... after being pulled apart from the roll. Service was not a problem during my visit, but the sushi rice clearly needed improvement. 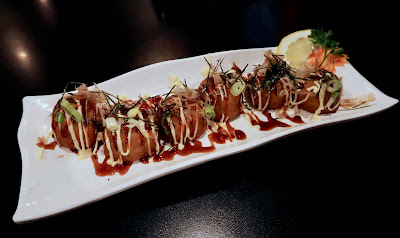 The one item that I had without any sushi rice (the Takoyaki) was very well executed. I did not try any of the Korean menu items, but perhaps (and hopefully) they are a little more angelic than the Japanese dishes.